The letter below describing the coronation and anointing of Charles VII was written by three gentlemen of Anjou to Queens Marie and Yolande (wife and mother-in-law of Charles VII) as a report to them on the proceedings. 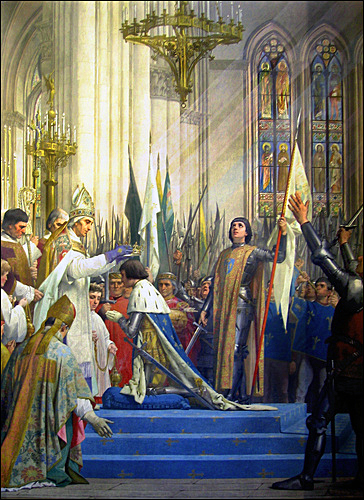 The three men were eyewitnesses to the event held in Reims Cathedral on July 17, 1429, and their letter is the only surviving official description of the ceremony involving Charles VII and Joan of Arc. Our Sovereigns and very honored ladies. May it please you to know that yesterday the King arrived in this city of Reims, where he found all in complete submission. Today he has been anointed and crowned; and a fair thing it was to see the beautiful mystery, for it was as solemn and as fully furnished with all the requirements appertaining thereunto, as well and as suitably appointed for its performance, with as many royal robes and other things necessary to the occasion, as if all had been ordered a year before; and there were so many persons as would be a thing without end to write, and as well, the great joy that each felt. My Lords the Duke of Alencon, the count of Clermont, the Count of Vendome, the Lords of Laval and of La Tremouille were there in royual habit, and My Lord the Duke of Alencon knighted the King, and those above mentioned represented the peers of France. My Lord d'Albret held the sword during the said mystery before the King, and for the peers of the Church there were, with their crosses and mitres, My Lords of Reims and of Chalons, who are peers, while in the place of others, the Bishops of Seez and of Orleans, and two other prelates; and my Lord of Reims performed the said mystery and consecration which to him belonged. To seek the Sacred Ampoule in the abbey of Saint Remy, and to bring it to the great church of Notre Dame where the sacrament took place, were ordered the Marshal de Boussace, the lords de Rais, Graville and the admiral, with their four banners that eache carried in his hand, fully armed and mounted, and well accompanied, to conduct the abbot of the said place, who brought the said Ampoule. And these entered mounted into the said great church and descended to the entrance of the choir. In the same manner after the said service they have returned it to the said abbey, the which service lasted from nine o'clock until two. And at the hour that the King was anointed, and also when the crown was placed on his head, all assembled cried out "Noel!" And trumpets sounded in such manner that it seemed the vaults of the church must be riven apart. And during the said mystery the Miad was ever near the King, holding her standard in her hand. And it was a most fair thing to see the beautiful bearing of the King and of the Maid. And Gods knows it was wished that you were there. Tomorrow the King must depart, taking the road for Paris. The Maid has not doubt that she will bring Paris to submission. Our sovereigns and revered ladies, we pray the blessed and holy spirits to give you good life and long. Written at Reims, this Sunday, XVIIth of July.